Financial Planning and Wealth Management takes expertise and experience followed by dedication and discipline. Mike has developed a wealth management team to help you best meet your financial goals and objectives. The team focuses on wealth and risk management tied together in a comprehensive financial plan. All members of the team share Mike’s enthusiasm and commitment to a client-focused approach. Eric is responsible for creating comprehensive financial plans, implementing investment and insurance strategies and conducting annual reviews with clients. Upon graduation, Eric began his career at Northwestern Mutual as a financial representative with The Bohannon Group. He joined Erpelding Wealth Management in January 2005. Eric has obtained his FINRA Series 7 & 66 securities licenses as well as his Life, Health, Long Term Care and Annuity licenses. He has earned the Chartered Life Underwriter®, Chartered Financial Consultant®, Retirement Income Certified Professional® and CERTIFIED FINANCIAL PLANNER™ designations. He enjoys coaching his children’s various sports and is a loyal Minnesota Gopher basketball and football fan. Eric lives in Chanhassen with his wife Gretchen, their twins Eli and Sydney, and boxer Reggie. Bob is responsible for conducting new client meetings and annual reviews with current clients. He prepares financial plans and implements investment and insurance strategies. Bob believes client relationships are built upon mutual trust. He views his role as a behavioral investment counselor, helping clients avoid costly investment mistakes while keeping them focused on their most important goals. Bob holds a B.A. in finance from the University of Iowa. Bob earned his CERTIFIED FINANCIAL PLANNER™ certification, his FINRA series 7 & 66 Securities Licenses, and his Life, Health, Long Term Care, and Annuity Licenses. Bob enjoys spending time with his family, taking trips up to the cabin, and cheering on Minnesota's professional sports teams. He resides in Eagan with his wife Rachelle and their two sons Hudson and Henry. 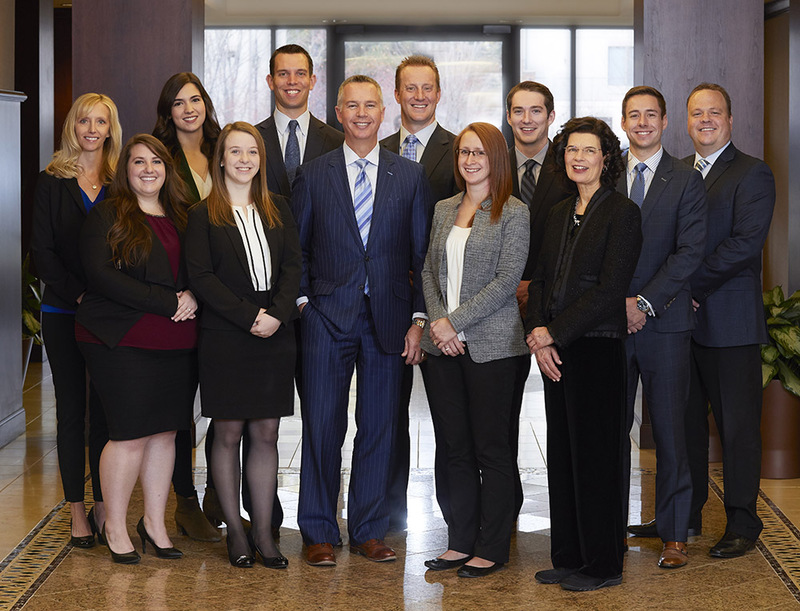 Cole Lunde joined Erpelding Wealth Management in 2018 and has been with Northwestern Mutual since 2014. He joined our team from Northwestern Mutual’s Concierge Planning group in Milwaukee which specializes in sophisticated retirement, estate and business planning for ultra-high net worth clientele with unique planning considerations. This experience provides Cole with a unique skill set to bring value to his clients. Cole works with new and current clients to plan for financial security through risk and wealth management tied to a personalized financial plan. He strives to help navigate clients through the peaks and valleys of life and the markets on the path to and through retirement. Cole graduated from the University of Wisconsin-Madison with a B.B.A. in Finance, Investment and Banking. Cole Lunde is a CERTIFIED FINANCIAL PLANNER™ certificant, Retirement Income Certified Professional® and a Wealth Management Certified Professional®. Cole has earned his FINRA Series 7 & 66 as well as the Life, Accident, Health, Annuity and Long Term Care licenses. Cole lives in Minneapolis and enjoys his summers on the boat and golf course and the winters on the hockey rink. Lisen is responsible for the overall operations of Erpelding Wealth Management and manages the insurance product process. Lisen also handles the vast majority of client services for the insurance products. Lisen graduated from Luther College with a degree in business management and a minor in economics. She joined The Erpelding Financial Group in May of 1996. She has obtained her FINRA Series 6 & 63 as well as her Life, Accident, Health, Long Term Care and Annuity licenses. Lisen enjoys being active in the community and her children’s school, swimming and attending sporting events with her family. Lisen lives in Minneapolis with her husband, Leif, and two sons, Andrew and Aaron. Please contact Lisen for any insurance-related questions. Eric graduated from Colorado Christian University with a degree in Computer Information Systems Management. He has been with Northwestern Mutual since February 2005 and joined Erpelding Wealth Management in August 2009. Eric has earned his CERTIFIED FINANCIAL PLANNER certification and is licensed for both securities and insurance products. Eric lives in Chanhassen with his wife, Stephany, and their three children. Please contact Eric with any investment account related questions. Miriam, also known by the team as Millie, is responsible for creating comprehensive financial plans used in the implementation of investment and insurance strategies. Millie graduated from Benedictine College in Atchison, Kansas in May 2014 with a B.A. in English and minor in business. She has obtained her FINRA series 7 & 66 Securities Licenses, as well as her Life, Accident, Health, Annuity, and Long-Term Care licenses. Millie enjoys road trips, spending time with her nieces and nephews, and canoeing. She lives in Vadnais Heights with her husband, Brad.